Richard Florida takes a lot of heat in certain quarters. As one of the most widely known economics writers, that makes some sense. Pretty much anyone who achieves a certain level of popularity acquires haters along the way. But most of the criticisms of Florida seem wide of the mark to me. Consider the one that he’s in it for the fame and rock star lifestyle. Well, let’s assume so. What’s your point? Who doesn’t want to be famous, or at least at some level well known in their field? I’ll admit I’d like to be much more widely recognized that I am. Is that a sin? Popularity in and of itself has nothing to do with whether or not your stuff is any good. Then there’s the one that suggests Florida is fleecing the rubes, such as the recent attack piece by Alec MacGillis in the American Prospect. The author suggests that Florida took money from towns in bad faith, knowing their cause was hopeless, then turned around and pronounced them beyond salvation. MacGillis mentions Florida’s $35,000 speaking fee and $250,000 consulting reports as evidence of how much money he’s acquired, but fails to put these numbers in perspective. While they might sound big to some people, ultimately they are a nit in the world of public expenditures. Consider this: Foundations alone in the state of Indiana spent a staggering $450 million on “brain drain” initiatives in just the last five years. I suspect other states spent similar sums. Cincinnati recently spent about $1 billion to build two new sports stadiums. Again, many other places did likewise. The point is not to criticize these expenditures, but to highlight that hiring Richard Florida to speak isn’t even a rounding error compared to the amounts spent on other development initiatives. Also, the problems of struggling Rust Belt burgs are daunting. Years of trying to stem decline using every strategy under the sun has largely been ineffective. I don’t think anyone could legitimately believe that they could pay Richard Florida to sprinkle some creative class fairy dust on these places and turn them around over night. It’s just not realistic. If a Florida speech couldn’t turn around Toledo overnight, it’s not like there’s some readily available strategy that could. Turning around the Rust Belt is an effort that will take years of hard work with no guarantee of success. Pittsburgh is getting a lot of press now, but that city’s turnaround was 30-50 years in the making. I might even suggest that if there is any scamming going on, the arrow is pointing the other direction. Cities go hire a big name like Florida to give a speech or two and do a few flash in the pan arts projects, all for a very small sum of cash. They trumpet that as showing Something Is Being Done and that change will happen Real Soon Now. Then they go back to doing what it is they really want to do — namely spending money on all those other things. A tautology lies at the heart of Florida’s theory that has limited its instructive value all along: Creative people seek out places that draw a lot of creative people. Florida has now taken this closed-loop argument to another level by declaring that henceforth, the winners’ club is closed to new entrants. I posted a piece by Ryan Avent who said that’s really how it works. But rather than a tautology, I prefer to think of this as a positive feedback system. A tautology is something that is true by definition. Mathematical truths like “2 + 2 = 4” are tautologies. A positive feedback system is one where an effect tends to produce more of itself. Consider college sports teams. Good teams are able to recruit better players. Better players generally mean a better team, which enables you to recruit better players, etc. If you’ve got a good coach, plenty of money, and some good luck, your team can remain a powerhouse for years. That’s why, to the great dismay of all Americans who don’t live in North Carolina, Duke has a good basketball team pretty much every year. Conversely, if your team is not so good, it is harder to get and stay in the top ranks. The door isn’t closed, but you’ve got to work harder to get into the club. This type of effect happens in many different places, and cities are one of them. This isn’t always good by the way. Positive feedback systems are often unstable and prone to runaway behavior. Growth itself tends to be a positive feedback system, and we saw several metros where housing growth got carried away and crashed hard. The ever increasing upscaling of top tier metros is driving costs through the roof and destroying the economic viability of anything other than high end activities, a phenomenon I explored in a piece called “Migration: Geographies in Conflict”. Negative feedback systems such as the thermostat that controls your furnace and air conditioner, tend to be much more stable. Lastly, there’s the claim that Florida’s creative class theory is reductivist and radically over-simplifies the truth about cities. This is accurate to some degree but I think misreads what Florida is doing. I don’t think he intended Rise of the Creative Class as his application to the Nobel Prize committee. It was a book targeting a popular audience. In that light it ought not to be compared against dense, nuanced, academic tomes, but rather against other popular press books like Tom Friedman’s The World is Flat. Indeed, I think of Florida as a lot like Friedman. Both of them have been able to take extremely complicated phenomena like globalization and package them in a way that is accessible to a mass audience. Florida and Friedman have differing paradigms of globalization, but in a sense they are both right in that they illustrate important aspects of the world we live in. Because Florida is so good at this, he’s been able to radically change the policy discussion in America all the way down to places like MacGillis’ Elmira, NY in a very important way. Strip away the “creative class” packaging and look at the basics of what Florida is saying, and I frankly don’t think it is that controversial. If you think of creative class as merely recognizing the increasing importance and primacy of human capital, I think almost everyone would agree. But I don’t think that’s a notion that was even on the radar of many civic leaders in America until Florida came along. I don’t think any other contemporary author other than Friedman has had a similar impact on the policy discussion. This is a very valuable service. Or consider the “three T’s”: talent, technology, and tolerance. We already addressed talent. Anyone want to take the position that technology is unimportant today? Anyone want to claim intolerance is a virtue? It’s easy to mock the notion of adding gaydar to the index of leading economic indicators and the like, but guess what? Things like the porosity of social networks and welcoming of newcomers and new ideas are absolutely critical to civic success. This has been demonstrated by the likes of AnnaLee Saxenian, who attributed the triumph of Silicon Valley over Boston’s Route 128 to this. Surely Florida could have made his books more dense and nuanced, and they might be more robust as a result, but they’d certainly be much less read – and I’m not sure cities would be better off for that. Which brings us to his latest book, The Great Reset, based on his Atlantic cover story “How the Crash Will Reshape America”. Again, let’s look at this as trying to communicate a complicated topic to a popular audience. In that light, let’s not get hung up on packaging. You might not buy the framing device of “great resets”, of which this is the third, or the various attributes of them such as “spatial fix”. But that’s almost irrelevant. There’s something going on out there in the world. We’ve been in the middle of it for a while, and the Great Recession has brought it into stark relief. Its the end of the industrial age in America and the West and the beginning of something else. Some call it the age of globalization, others the information age. Who know what history will judge. But the point is that we are in a transition period from one era to another. It’s a period of uncertainty. We don’t know what the future will hold. Florida admits he doesn’t have a crystal ball either. But he is willing to make some prognostications and talk about what he thinks it means. The first part of the book is a history lesson that tees up his reset frame. I won’t cover that here. The second part is an overview of how he thinks various cities and regions in the country will fare in the coming years and in the new era. Florida’s basic take is that the crash is going to accelerate the transition from the old world to the new by speeding up trends that were already underway. This is a risky move since if there’s one thing we’ve learned it is that history is wildly unpredictable and extrapolating trends into the future always breaks down at a point sooner than we think it will. One the other hand, this makes the predictions mostly plausible. For the short term at least, they seem reasonable. My own view is that we are still in the early innings of the new era. Sometimes the cities that seem the best end up falling by the wayside. Cincinnati was the original Porkopolis, but ended up superseded by Chicago during the second half of the 19th century, for example. Chicago itself was a comparatively late bloomer during the industrial revolution. But it was in the right place at the right time. The further into the future we go, the more likely some newcomer will surprise us. So let’s take a look at some of the predictions. Florida’s first one is that New York will remain on top, despite being the epicenter of the financial world that was at the heart of the crash. Ed Glaeser has made similar claims. This strikes me as likely since New York isn’t just #1 in finance, it’s #1 in lots of things. Florida actually predicts that most US financial centers, ranging from Chicago to Charlotte, will do well. He also predicts big government cities, of which Washington DC is the ultimate example, will thrive, which seems, alas, pretty likely. I was eager to see what what he’d say of the Rust Belt. There’s been a lot of talk such as that of MacGillis that Florida has said many Rust Belt cities are hopeless, but I hadn’t actually seen him write it anywhere. In this book, Florida clearly recognizes the challenges facing struggling manufacturing towns. And he doesn’t sugar coat the fact that further troubles are likely for many of them, and that turning around places like Detroit will be a generational effort at best. This may sound harsh, but unfortunately it is likely true, especially for smaller cities that don’t have the critical mass of human capital and infrastructure to operate effectively in the knowledge economy. But he definitely does not say it is hopeless, and in fact talks about some positive examples, such as Pittsburgh. The Pittsburgh story is based around investments in educational infrastructure, grass roots neighborhood, initiatives, and a long time frame. The roots of the Pittsburgh turnaround are decades old. He thinks this is the path others will need to take. Florida’s recipe for cities is to favor grass roots change over big, top down redevelopment initiatives like stadiums, and investing in quality of life and place making. But he, like Glaeser, says that the primary focus of investments ought to be people, not places. This isn’t a matter of writing off cities or not writing off cities, but rather a political or philosophical question about where the focus of our investments ought to be. I don’t think it is either/or and neither does Florida, but you’ve got to make some choice as there aren’t unlimited funds. Where do you give the priority? I for one am in the camp that we need to look at people first. For one thing, there is no guarantee we can renew every single city, no matter how much money we spend. It’s not like there’s a magic formula out there that we just aren’t following. And any revitalization could be a long time down the road. What do we do about the people who are suffering and lack opportunity in the meantime? And what about the human cost if we fail? People may not want to move and we shouldn’t force them to in most cases. But leaving people who have no choice stuck where they are isn’t good either. One of the best ways to give people chances to improve their lives is by giving them mobility options. We can do that through better education, which should be unobjectionable. But I might also suggest even going further than Florida and helping people who want to relocate but can’t to do so, such as by helping to extract them from underwater mortgages. In any case, giving people mobility options means they aren’t part of a captive local labor market and that they have a greater universe of opportunity to better their lives. This is already running long, but I want to highlight three other areas of the book. The first is the idea of upgrading service jobs, similar to how manufacturing jobs were upgraded to good jobs in the post-war era. Florida suggests doing this via making them more creative and fulfilling. I was surprised to see that he did not mention unionization as a possibility. Now, I happen to think old school unions are an anachronism, but if other parts of the economy can reinvent themselves, there’s no reason unions can’t too. After all, unionization was a principal way manufacturing jobs were upgraded. The second point is about what Florida has taken to calling the “rentership society”. The term is provocative, but Florida actually only suggests pulling back from a peak of around 70% home ownership to 55-60%. He also suggests a pullback from ownership in other areas beyond houses as well. I think it is very clear that we got carried away with trying to promote homeownership at all costs. The notion of a house as a way to make quick bucks, or as an ATM machine to finance consumption is also clearly past its sell-by date. Many financially marginal people became “owners” who had no business doing so. I wish I rented instead of owned right now. It is clear the dial is going to turn here. But I believe there are several challenges to significantly increasing rentership rates. First, rental property in the United States is designed for younger people or lower income people and not generally for middle class families. Also, people with any degree of discretionary income are going to want to customize their space. That’s generally not possible with renting, plus how would you recover the value of, say, redoing the kitchen or a bathroom? Paint colors I can see, but not a lot beyond that. In order to really get people to buy into the renting idea, I think we’d need a vastly different definition of what it means to rent in America. The market would have to supply a very different product. Florida had some ideas about companies that supplied new types of rental properties, but what he discussed didn’t sound compelling to me. Also, there is a benefit in financially diversifying into real estate assets, and, like 401(k) contributions, the monthly mortgage payment enforces a sort of savings discipline it might be hard to replicate for renters. This is something that would also need looking at. And are Americans culturally inclined to way to rent? The desire to own your own piece of land seems deeply engrained in the American pysche. I can see more renters than today, for sure. But how many is that? I can certainly see it appealing on a discretionary basis to Florida’s “super-creative core”, or however you want to think of people who are a part of global labor markets and for whom mobility is key. But I wonder if this is something average Americans will embrace? Education and infrastructure, creativity, and connectivity — these are the things we can address…Government has its most important and legitimate role to play in establishing the enabling framework for a new era of shared prosperity, and it squanders precious resources that could support such future-oriented, prosperity-boosting efforts when it chooses to bail out old industries, breath life back into outmoded institutions, or place Band-Aids on problems. Such approaches may or may not stop the bleeding, but they won’t keep us from failing again. And they will do little to set us on the path to a better future. It’s time to make a 180 here, folks. The Great Reset is definitely a worthwhile read. Again, any way you look at it there’s a major shift going on. Florida’s book gives the broader public the opportunity to step back from the detailed events of the day and look at the broader macro picture. We all ought to be thinking through for ourselves the implication of the new world we live in, and this accessible work highlights some of the key considerations. Richard Florida discussed his book this week on Smart City Radio. You can listen to the show below (click here if the embedded player doesn’t display for you). A quick comment on the issue of rental versus ownership. The ‘problem’ with a rental society is that by definition you are creating a rentier class (folks who derive their living from owning property that other folks live on). This has often been a source of major conflict (slumlords and gov’t housing are the most prominent examples). Rentier classes also are prone to manipulating the politics of ownership to their own benefit. Certainly too many folks were buying houses they couldn’t afford, but we have to think through more fully whether we want to a create a class that derives its wealth from renting property. Rentership is the common practice for corporations. Nowadays, businesses are more likely to lease their space rather than own it. Besides real estate, this also applies to other durable assets. For instance, commercial airlines seldom own the planes they fly. Would the same thing apply for people? Depends. Rentership, in relation to home ownership, is a much more sensible option in the coming years. The job picture for Generation X and younger is one that demands worker agility. These workers don’t know what it’s like to start at the bottom of a single firm and work their way up the corporate ladder. The new normal is to go after opportunities by switching employers often. This can mean moving to different regions or switching careers in the span of their working years. Finding and unloading a house is a troublesome business, especially with the current market meltdown. Leases are much more flexible, and smaller spaces allow more people to live in the areas they desire. Under this scenario, rentership will be more viable because it reduces the stigma society puts on tenants. Let’s face it, there was shame in not owning a home. Homeownership signified thrift, responsibility and status. Anyone who didn’t own a home was seen as stupid, bad with money or a derelict. This even manifested itself in land-use policies that either forbade multiunit housing or segregated them to the least desirable areas. Of course, the aftermath of the housing bubble brought on things like jingle mail and methburbs. A 50-50 split between home ownership and renting would be more realistic. The property acquisition urge will still be there, and buying a house is primarily an emotional decision. This will continue to drive property acquisition. It’s interesting that you should bring up the absence of unions in Florida’s writing. Another book you should look into is “Nice Work if You Can Get It: Life & Labor in Precarious Times” by the sociologist Andrew Ross. He is an admitted skeptic of Florida’s ideas and devotes a lot of type to that issue. Wad, I think you’ll find companies dislike owning because having the assets on their balance sheet makes their capital efficiency look bad. Most corporations have leases on their facilities that make it difficult to flex the space. Having said that, new products like the Regus space is giving more true flexibility in corporate space. David, you hit on a good point around how a major change in the balance of renting vs. owning would produce changes in the American social structure. There are potentially many more. For example, property ownership has long been linked to citizenship in history. People who own property are making a statement about their commitment to a place and tying their fortunes to it. A town full of transients is likely to have a very different view of policy than a town of long term owners. Owners are often viewed as preferred to renters in condo buildings, for example. Clearly in my own building those who own units are far more committed to long term viability for the building. Also, renting doesn’t necessarily give you flexibility. People who are in rent controlled apartments in New York with below market rents more or less can’t move unless they leave town (or are fortunate to be wealthy). On the other hand, the growth machine hypothesis might suggest this land ownership puts negative structural incentives in place. So perhaps rental is not all bad. I think the key point is that making a material change would change a lot of things we don’t know about yet. However, what Florida is talking about is really not a true rentership society, but one in which more people rent. I’m not sure 55-60% renters would create a major change. Might help to look at countries with more renters. In Germany it’s perfectly normal to install your own kitchen appliances (and take them with you when you move, after all, the next tenant will have his own stuff). It is the home “owners” (mostly when we talk about owners we’re really talking about people don’t “own” so much as “owe” a lot of money on the mortgage) who are fanatically risk-adverse and desperately fight any change, even obviously positive changes, in the neighborhood. After all, if anything goes wrong and property values drop, it’s the end of the world. It’s the owners who stand to benefit from increasing housing costs (they already bought theirs and hope to realize capital gains someday) and who will fight any building of any housing anywhere. Supply and demand and all. I’ll admit to being a partial Florida skeptic, but I haven’t yet read The Great Reset and I’ll give it a chance. I live in Seattle now, and it’s a fantastic city, but I wonder if my meager talents might be put to better use in a place like Detroit or another midwestern city. I don’t mean that in a Lone Ranger-rides-in-and-saves-the-day way (I’m not that self-assured! ), but I grew up in metro Detroit and it seems to me that the area (and other areas like it) need some folks willing to work for the area’s future, even if they are migrants or boomerangers like myself (potentially). Any ideas why the cooperative model works for housing in New York City but is otherwise an anomaly in the US? The only common examples I can think of in my area are the coop housing on university campuses and the farm coops that run grain elevators and related operations out in the rural areas of the state. The coop model seems like a viable alternative between the ownership and rental models that would give more flexibility that the ownership model but more stability than you get with a rental situation. I grew up in a CO-OP in Connecticut. It’s not all that different from a condo, in truth. Instead of owning your unit with common ownership of the land, you own a share of a corporation that owns the land and units, with the right to use a certain designated unit. Economically it functions almost the same, since ultimately what you’re buying is the right to live in an attached unit. Legally it’s somewhat different, but I don’t think the average person cares much about that. 1. Quotes: “The place we live is the hinge point of the creative age.” “Movements of racial equality, the student movement, etc. in the 60s were a giant temper tantrum as society unleashed pent up creative energy that was being held back by the system.” “The legacy of the 60s is places like Silicon Valley.” I get the sense that he’s so invested in the urbanist creative class lifestyle that he’s trying to justify it. I think he takes some correlations and makes causalities out of them. For example, is San Francisco the tech center of the U.S. because it’s a cool place for techies to live and it was tolerant? Or did it offer the economic building blocks needed to build new tech companies, which caused techies to come and to make San Francisco a place where they are comfortable? I argue the latter, but sometimes get the sense that he’s arguing the former. 2. Quotes: “We talk about creating good jobs in America. We talk about getting manufacturing back in our country. Why?” I really believe that one of our major problems in the U.S. is that we have abandoned the manufacturing base in this nation. While this quote may be a bit out of context (he does have this quote too: Every community has to make a commitment to bring creativity and innovation into factory jobs) it seems that the overall tone of his concept is that we need to just discard the old economy and replace it with creative class jobs. Here in Ohio, agriculture is still our single biggest industry. While I agree with his assertions that we are overly-materialistic, we do need a foundation for our economy, and that foundation is always goods. Services are ONLY valuable if they make goods better, cheaper, easier to obtain, etc. Computers don’t replace food. They makes it easier to get food around the world, but creative jobs alone does not make up an economy. 3. Quotes: “We need to create a new kind of society for true creativity.” “The place we live is the hinge point of the creative age.” Again, he is arguing that we need to basically dispose of our old economic framework and rest on creativity. While to a point I agree, and that’s been happening, I still get the sense that he’s taking it to far. Is he saying that we need to create a new kind of society, and that the single most important thing we can do in this quest is pick a good (read hip urbanist) place to live? Isn’t that just replacing the ego-boost of materialism with another ego-boost? George Mattei voice some of the concerns that I have about Florida’s arguments. I think Florida has some valid points to make, but I’m not sure I buy into his ideas wholesale. For example, with regard to Silicon Valley, the groundwork for the area’s growth as a high-tech center had been laid long before the late 1960s. What mattered just as much – if not more – than the social and cultural changes of the 1960s was the considerable federal spending that was being directed to places like California, particularly for military-related research. William Shockley, Fairchild Semiconductor, the “Traitorous Eight”, etc. were all making their mark on the creative economy as early as the 1950s. The advantage I see with the coop model is that it potentially has more flexibility than owning a condo. Not sure if that’s true in real life which is why I asked. But wasn’t the equally true of other places in the country? It wasn’t as if California was the sole beneficiary of this influx of federal dollars. My problem with Florida isnt that he’s generally “wrong”, but that he’s often “right”. I too have also compared him to Thomas Friedman . But not as a compliment. Friedman’s basic point in “the World is Flat” is that the world is more interconnected. But is there anyone who doesnt believe that? To be blunt, the only thing keeping Friedman’s book from seeming like its just stating the obvious is his gimmick of saying that “the world is flat”. Its the same with florida. does anyone NOT think that cities should try to attract well educated people ? But what Florida does is come up with the term “creative Class”. But other than a new term and some new phrases , he basiclly seems to just be stating the obvious.There just seems to be too many buzzwords . I will admit to not reading his books. But i have read several of his articles in The Atlantic Monthly and other places. My final criticism of Florida is the fact that he seems to think that the entire “creative Class” is only made up of hipsters between the ages of 20 -40. At least where i live [Baltimore City] there are a lot of the “Creative Class” moving into the City. But when they have children they move right back out. Not every educated proffessional fits into MR Florida’s image of a bike trail riding, coffee house going , member of the “Creative Class”. Maybe im misreading Florida’s writings. But it seems like his vision of the city of the future is one where the city serves as an after -college dorm where hipsters live, drink coffee at coffee shops and bike on bike trails until they get married and have kids . And then they move out to suburbia and are replaced by other hipsters. Some of what MR Florida writes is true. But true things he writes doesnt strike me as original. And he surrounds his good ideas with a lot of buzzwords. i dont pretend to know exactly how to do this. I do know that it will be hard work and wont happen overnight. but i dont think that we can solve our urban problems by building bike trails [and for the record i like to ride bike trails] and using buzzwords and spending tax payer money on gimmicks [ my city spent almost $100,000 on a new slogan that i dont even remember]. Thats just my humble opinion. 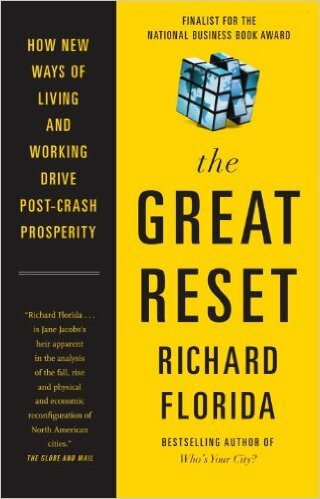 Hmm, I read Richard Florida, and his book the Great Reset, a little differently. Although since your blog entry was not suppose to be a chapter by chapter critique maybe you agree with my conclusions below. Florida has 4 ideas in the book and in his writings that seem to apply to the Urban Midwest (what he basically calls Chi-Pitts). 1)	Most importantly Richard Florida is betting on top talent and the places (Chicago, Universities, etc) and organizations (non-profits, tech, etc.) where this talent congregates to make the future happen. 2)	Florida uses Pittsburgh long term grass roots efforts as a model on how a city can transform itself over time — like in 30 years. 3)	Florida sees distances shrinking due to high speed rail (a big proponent) and modern telecommunications. This means that the Midwest mega-urban region Chi-Pitts is not an intellectual category or a buzzword but, to Florida, it is instead an actual economic unit that will continue to further integrate over time. 4)	Florida thinks that many of the smaller rust belt cities, like the old mill towns, will be very difficult to save. So what do you get if you combine all 4 ideas? It seems to me you get the urban Midwest (Chi-Pitts) replicating the pattern of the Northeast Corridor, or what Florida calls Bos-Wash, within a single generation (2030). This is my analogy and Florida does not draw this parallel in the book. This is my interpretation of how it looks to play out. Chicago will continue to dominate the region acting just like New York does and if you just extend that analogy outwards you get the rest of Chi-Pitts. Places like the Detroit Metro Area and Cleveland probably connected by high speed rail and teleconferencing, become like Philly, gritty satellite cities of Chicago long on the upswing. Milwaukee becomes like Hoboken. Ann Arbor and similar universities towns would continue to generate an increasing region of tech and other start-ups just like the zone currently around Princeton and to a lesser extent Yale. Ideally perhaps a Columbus or a Madison stages a break out in the next 20 years and becomes a proto-Boston/Austin. In any case, the state capitals, as well as the many Meds and Eds centers, would replace Washington DC as the government boom towns. Also many of the failed industrial towns like the failed industrial cities that dot the current Bos-Wash Zone will continue to be problem areas. Thus like Chicago is the cheaper New York, Chi-Pitts becomes the cheaper Bos-Wash. This would be a true transformation of the region. This is certainly a very plausible, and on the whole, a very positive vision for the Midwest. My take is that I am a bit skeptical that Florida’s vision will come to pass. Having places that attract talent is always good, but it is hardly always transformative in the ways that I think Florida is counting on. Also I think the Midwest maybe still too diffuse, even with some further future integration, for this vision to emerge in the next 20-30 years. Despite my objections, the quicker technology and economic integration advance, the more likely Florida’s urban vision becomes. True, California wasn’t the only place that benefitted from the post-World War II boom in federal spending on things like R & D, but it benefitted much more so than other places in the United States. The trans-Mississippi American West generally was the site of considerable federal investment since the mid-19th century, and California particularly so. The comparison to The World is Flat is the most damning criticism I’ve read of Florida so far. Concerning Co-ops, I didn’t see them as any more flexible. At least not the one lived in. It seems like many agree that Florida takes some good concepts and overplays/overhypes them. Yes, educational institutions are great anchors around which to build economies and rebuild neighborhoods. However, if you don’t have a big one, or several, and you don’t have a reason for tech to come to your town, what’s the take-away? The danger is that you fall into the trap like Michigan, which did it’s “Cool Cities” program. Building a playhouse and a bike trail in downtown Flint or Kalamazoo isn’t going to make it the next Austin. Aaron, it would be interesting to see your take on the new Brookings State of Metro America. They do an in-depth study of the top 100 metros, pull out meta-trends, and also classify metros by several different groupings. This grouping schema is one of the best I have seen so far, much better than “Tust Belt” vs “Sun Belt”. Looking at these groupings, it’s clear that Florida’s vision just doesn’t apply to many cities in the U.S.
That was never the intent of the “Cool Cities” program. The program, unfortunately, became an easy target for opponents of Governor Granholm, who used it as an example of out-of-control government spending on “trying to be cool” instead of on rebuilding the Michigan economy. The reality is that it was a very modest program that had some very successful projects that came out of the funds that were spent. While the name is easy to mock, I think most of the goals of the program are consistent with what successful urban areas have pursued. I sympathize with aim. It’s easy to take potshots at government initiatives, however modest, to affect change. The absence of a formal Federal industrial policy should not diminish state efforts to do something to try and attract the interest of talent and investors. It’s so typically Midwestern to trash innovative thinking. And boring. I think the affects of globalism on the Midwest are analogous to the invasive and traumatic affects that urban renewal had on communities, ala Jane Jacobs in “The Death and Life of Great American Cities.” Only now there has been no building or significant Federal investment to replace what was lost. At least with urban renewal way back when, something was built to “improve” previous conditions. Not so lucky this time around. The mindset that globalsim is somehow inevitable is enormously destructive for Midwestern communities – especially for the political classes. I may be wrong, but to borrow a phase from my mother, a Missouri farm girl, the chickens are about ready to come home to roost. Carl, good intentions do not make good policy. Lenin and Mao intended to create egalitarian, poverty-free societies; they did not intend to usher in mass famines. I don’t know about you, but I prefer innovative thinking to produce good results. Michigan’s abject failure to do what’s necessary, i.e. promote economic diversity, is not excused by the fact that it tried to implement solutions right out of some consultant’s playbook. If anything, it’s an aggravating circumstance: it shows that Michigan can’t tell when it’s being sold a bill of goods.